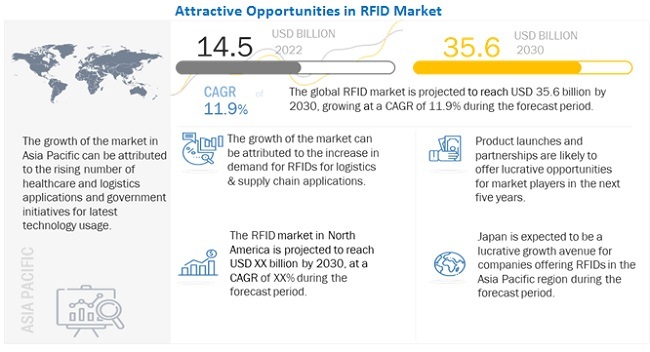 [346 Pages Report] Driven by lower prices of radio-frequency identification (RFID) tags, and increasing penetration of RFID technology in various industries, the RFID market is likely to witness high growth in coming years. The RFID market was valued at USD 16.95 Billion in 2016 and is expected to grow at a CAGR of 7.7% between 2017 and 2023. The base year considered for the study is 2016, and the forecast period is between 2017 and 2023. The objective of the report is to provide a detailed analysis of the RFID market based on products and tag market based on wafer size, working, frequency, applications, form factor, label type, and region. The report provides detailed information regarding the major factors influencing the growth of the RFID market. The report also provides a detailed overview of the value chain of the market. The research methodology used to estimate and forecast the RFID market begins with obtaining data through secondary research such as RetailWire, RFIDJournal, and the newsletters and whitepapers of the leading players in this market. The offerings of the tags, chips and software providers have also been taken into consideration to determine the market segmentation. The bottom-up procedure has been employed to arrive at the overall size of the market from the revenue of key players. After arriving at the overall market size, the total market has been split into several segments and sub segments, which then have been verified through primary research by conducting extensive interviews with officials holding key positions in the industry such as CEOs, VPs, directors, and executives. The market breakdown and data triangulation procedures have been employed to complete the overall market engineering process and arrive at the exact statistics for all segments and sub segments. The breakdown of the profiles of primaries has been depicted in the following figure. The RFID ecosystem comprises chip and inlay providers, tag manufacturers, reader and software providers, and system integrators. The players involved in the development of RFID solutions are Impinj (US), NXP Semiconductors (Netherlands), Alien Technology (US), and Avery Dennison (US), among others. End-user industries such as retail, logistics and supply chain, commercial, sports, healthcare and others. This study answers several questions for the stakeholders, primarily regarding the market segments to focus on in the next two to five years for prioritizing efforts and investments. This research report categorizes the overall RFID tag market, based on wafer size, working, frequency, applications, form factor, label type, and geography. Further analysis of competitive trends influencing the companies, which involves PESTLE, Porter’s Five, and SWOT analysis. 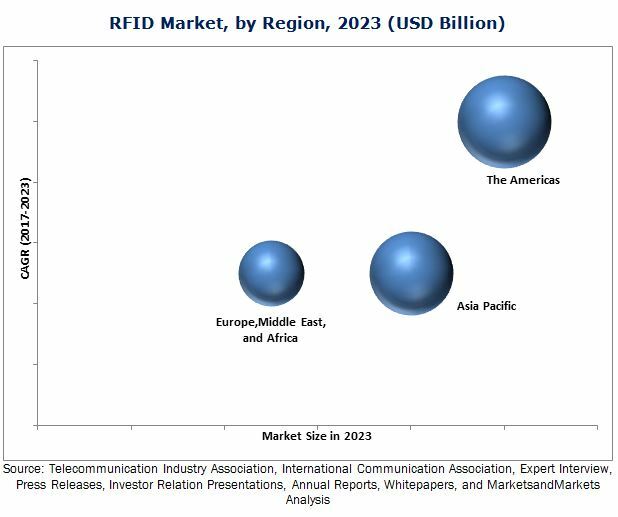 The radio-frequency identification (RFID) market is expected to be valued at USD 31.42 Billion by 2023, growing at a CAGR of 7.7% between 2017 and 2023. The growth of this market is fueled by the increasing installation of RFID in manufacturing units for productivity improvement; increased usage of security & access control application; increasing government initiatives; high adoption of RFID technology in retail industry; and development in the RFID ecosystem through organic growth strategies such as mergers and acquisitions, and collaborations. Among all products in the RFID system, the market for RFID tags is expected to grow at the highest CAGR between 2017 and 2023. Reduction in the costs have led to rise in adoption of RFID tags; demand for the tags will continue to raise competitive situations in the market, which in turn will lead to further innovations in the RFID systems. Ultra-high frequency (UHF) RFID tags enable multiple tag reading that means user can read more RFID tags in one go, which is not supported by LF and HF. Multiple tag reading helps in reducing error, thus facilitating efficiency in automation. UHF RFID is currently the only type of RFID to be regulated by a single global standard. Among various applications, the commercial industry accounted for the largest share of the overall RFID market based on the end-user industry in 2016. The commercial sector is witnessing good growth, an in turn, are using RFID to optimize their operations and give them a competitive advantage. Since past few years, there has been significant improvement in demand for innovative technologies that are enabling end-users to fulfill customers’ needs. RFID technology enables the commercial industry to identify and track items, and thus, enhance data center and warehouse management across various verticals such as IT asset tracking, laundry management, and jewelry tracking. The increasing population, along with rising commercialization, are driving investment in the RFID systems, and software. The Americas is expected to hold the largest share of the RFID market during the forecast period. The players in the Americas region are emphasizing on research and development activities, to facilitate operational efficiency through advanced technologies. Furthermore, the adoption of RFID technologies and a significant number of established players in the market are driving the demand for RFID tags in the Americas. The key restraining factors for the growth of the RFID market are higher costs of installation of RFID systems and device interoperability. RFID adoption in any industry requires high investment regarding tags, readers, software, running replacement services, and electricity. More features such as accuracy checking of system, IoT integration, and training cost makes RFID solution costlier. This restrains adoption of RFID. Meanwhile, device interoperability restrains the implementation of RFID. For example, the ability for a single reader to read tags from multiple frequencies is difficult and complex. If organizations have multiple frequency tags and a single reader, then device interoperability issue may occur. The key market players such as Impinj (US), NXP Semiconductors (Netherlands) and Alien Technology (US) are focusing on the strategies such as new product launches and developments, expansions, contracts, and collaborations to enhance their product offerings and expand their business. Also, they have launched disruptive technologies in tags and gateways which are currently bolstering the RFID market. *Top 25 Companies Analysed for This Study are - are Impinj (US), NXP Semiconductors (Netherlands), Alien Technology (US), Avery Dennison (US), Smartrac (Netherlands), Invengo (Singapore), Checkpoint Systems (US), Mojix (US), GAO RFID (US), Nedap (Netherlands), Zebra Technologies (US), Globeranger (US), HID Global (US), Applied Wireless (US), Caen RFID (Italy), Honeywell (US), Thing Magic (US), Identiv (US), SAG (US), Omni-ID (US), Vizinex RFID (US), Savi Technology (US), RFID Global Solution (US), Confidex (Finland), and Trackx (US). *Details on Business Overview, Products & Services, Key Insights, Recent Developments, MnM View Might Not Be Captured in Case of Unlisted Companies.